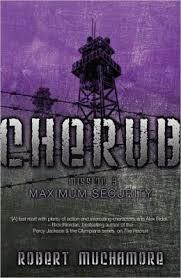 CHERUB mission 3 MAXIMUM SECURITY, By Jordan Sonnenblick is a fast read with plenty of action, and interesting characters. It is sure to keep your heart pumping non-stop. With an intriguing plot, and thrilling confrontations, this book will bring you into it’s world. CHERUB is based in the United Kingdom. The agency of CHERUB is a British branch of intelligence, specialized for infiltration, reconnaissance, and field operations. All agents are aged between 10 and 17 years old. CHERUBS are all orphans who have been taken out of care homes and trained to work undercover.They live on CHERUB campus, a secret facility hidden in the English countryside. The reason CHERUB uses kids is simple: nobody suspects kids are spying on them. James Choke, now known as James Anthony Adams, is one of those agents. His mother, who ran a shoplifting empire, died because of drinking alcohol in conjunction with medication she was taking for an ulcer on her leg. After this incident, Lauren (James sister) was taken into care by their stepfather, and James was sent to a care home. While at this care home, James made a friend with a boy named Kyle, who was on a recruitment mission for Cherub. James was picked up by Cherub and began his basic training a few weeks later. James completed his basic training, while making some friends along the way. With the help of his friend Amy, and his field operator. He succeeded on his first mission, scattering the terrorist group Help Earth, and saving innocent lives. This mission earned James the navy colored T-shirt, a symbol of rank at Cherub HQ. Now James new mission:Find and break out Curtis Oxford from Arizona Max prison. The son of infamous terrorist and illegal arms dealer, Jane Oxford. Arizona Max is a juvenile detention camp that serves life sentences to children under 18. But one things for sure, breaking in is the easy part. Breaking out? Thats quite a bit harder. with its thrilling action and immersive setting, similar to Alex Rider, Cherub Mission 3 is a fast paced read with plenty of action, I recommend this book to teenagers very highly because they can relate to the main character’s thoughts. It shows that kids can do good without the aid of a hi-tech gadget. Both kids and adults will enjoy this book. With its mixture of mystery, action, and conspiracy, kids and teens will especially love this book. Because it is something that they can relate to. This a must read for fans of Alex Rider, and fans of the secret agent genre.